Please join us for an evening of reading & discussion with CA Conrad! Conrad will be building a new (soma)tic for this event as well as reading from three new books. This event is open to the public. Admission is free, though token donations are welcomed. For directions, email David Wolach at wolachd@evergreen.edu. I can never have enough CAConrad, like paprika or wisdom in disguise. CAConrad is the son of white trash asphyxiation whose childhood included selling cut flowers along the highway for his mother and helping her shoplift. He is the author of Deviant Propulsion (Soft Skull Press, 2006), (Soma)tic Midge (FAUX Press, 2008), The Book of Frank (Chax Press, 2008), The Advanced Elvis Course (Soft Skull, 2009), and a collaboration with poet Frank Sherlock titled THE CITY REAL & IMAGINED: Philadelphia Poems (Factory School Press, 2009). He invites you to visit him online at www.CAConrad.blogspot.com. Conrad is the winner of the 2009 Gil Ott Book Award, co-founder of Philly Sound (http://phillysound.blogspot.com/) and a co-founder of the PACE project, a Philadelphia-based group which organizes poets to read their poems aloud on street corners to passersby. This event is part of the ongoing PRESS literary arts and politics reading series. Thanks to Pilot Books, and poet-curators such as Will Owen, Nico Vassilakis, and Robert Mittenthal--the latter who will be at Evergreen for a PRESS reading/discussion in March as well--I will be reading for the BIG PELT TALK Reading Series along with Reg Johanson at Pilot Book Store, March 21st. Might not yet have Occultations back from the printers, but will have the other new book of poems/essay/whatnot, Prefab Eulogies, with me to peddle (book swap!). Nico put his thinking cap on and sent along this list of readers for March at Pilot, and what a fantastic lineup. If anywhere near Seattle, please join us -- not just myself and Reg Johanson on the 21st, but for as many of these dates as your recessionary schedule can fit in. Thanks again, all, for setting this up. My book of improvisational poems/inter-poetic conversations, Prefab Eulogies Volume 1: Nothings Houses, is now available for purchase. These are some of my earliest poems, some written as early as between 2003-4, with yet several others written as late as this winter. You can go here, to the BlazeVox website and order directly, or you can order the book thru Amazon or SPD, both of which are linked on the BlazeVox Prefab Eulogies web page. Also on that page you can listen to a live recording of some of "Nothings Houses," a polyvocal work for multiple media (live voice, tape, typewriter, yellow stickies, and large film screen). A short excerpt of this multimedia work is in the new book as transliterated material. Check out the recording here. Other more dubious poems, telephone calls, ritualistic behaviors transcribed, songs sent to senators/congress-people, drawings of the inside of various body parts, and some essay, follows. This is a transitional book in many ways--though coming out now, much of it is earlier than the poetry I've published in more recent chapbooks. Hence, the book reflects (if anything) a transition from installation and performing arts into the questions of contemporary poetry, with which I'd been engaged for those years, but which I'd only written about--until falling ill, which really meant, for me, being unable to move in ways that I'd been used to in performance and in daily life. Of course I'm still undergoing that transformation, so this is no huge proclamation on my part, but something I've been reflecting on since last week when I got the proof in the mail. A huge thank you to poet & editor of BlazeVox [books] Goeffrey Gatza, as well as to Linh Dinh, Amy King, Jules Boykoff, Catherine Taylor, and everyone else who either edited, commented on, or otherwise helped get Prefab Eulogies out the door. 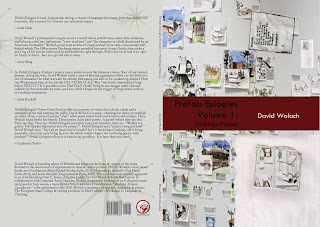 And please help spread the word that Prefab Eulogies is now out! 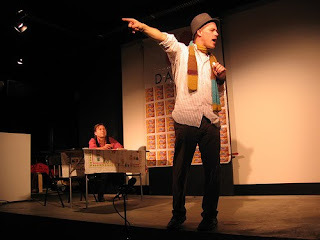 Join us Saturday, February 27th at Get Lost Books (1825 Market St., SF) for an evening of collective imagining! Artist EE Miller brings "Facilitate This!" to San Francisco, a multimedia group investigation into the "meeting" as the landing site of our fears and fantasies about collective possibilities. Facilitate This! specifically considers representations of group behavior in queer imagination and history through film screenings, presentations, and conversation. Festivities begin at 7:30 pm. Don't miss this crucial discussion! PS. And click here to view (and print) our late winter events calendar! Dear All: we are going to start the process of filling as many spots as possible for this summer's 95cent skool seminar. It will take a couple steps because of managing multiple mailing lists. ...or if (b) you have sent a message of interest and not gotten a note back — could you please send a note shortly? That will consolidate into one mailing list, at which point we will confirm everybody's availability from that list, and have a lottery. New work by Julian Brolaski appears in Elective Affinites this week, along with a host of other poets and their works, some of the poets I very much admire for their writing AND the way they treat other people (where the two are at least contiguous). Brolaski's work will also be featured in the forthcoming issue of Wheelhouse, Issue 9, to be published asap - proofs now being uploaded and sent to contributors. Do check out Brolaski's new work, as some of it is from a forthcoming Ugly Duckling Presse book--very exciting. During the time I've been away from Elective Affinities, Jamie Townsend (always a treat) and Laura Jaramilio have featured work. It's my first time reading Jaramilio's work, actually--and it's very good. These additions, remember, are only from the American contributors. There are several other countries participating, so do check those sites out as well as this rhizomatic anthologies grows. ON: A Journal of Contemporary Practice, a truly outstanding collaboration between Michael Cross, Thom Donovan, and Kyle Schlesinger, has just released ON 2. I'm just tonight ordering a couple copies, so I have yet to see the whole thing. But ON, for me, is one of the most exciting critical journals. It features contemporary artists writing on/with/for their contemporaries, involves what Thom Donovan has referred to elsewhere as "loving" criticism, and I can say this at least: what I've read is indeed loving--not lathering--and very, very good. I'm especially taken by C.J. Martin's critical look at the work of Rob Halpern, an essay that pivots around Rob's new Disaster Suites (Palm Press). So, from just the small sample I've read, I'm extremely glad to have an opportunity to purchase--for such small dough--a handmade/letterpress journal (beautifully designed by two world class book artists) that's so thick with ideas, playfulness, and studied tho loving critique. Get it here. Wonderful poet and damn important left political economist Jules Boykoff has an article in The Guardian. Why Protest the Olympics? Read here. Allison Cobb and Simone White have respectively released books this week, both from the (overall) awesome Factory School Heretical Text series (Boykoff, e.g., is in this year's catalogue). Order both from SPD here. 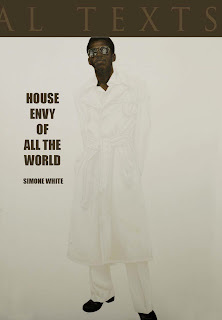 White's book, House Envy of All the World, is her first. For those of you not in New York or on the East Coast, get to know White's work. It's some of my new favorite poetry, and so I'm off to get this work asap. Plus White makes a mean espresso. Very happy for White, but more for us, as rarely have we had the chance to read White's work unless hearing it live, and yet despite the purposeful go-at-my-own paceness, there's been a great deal of buzz around White's work for some time. In Green-Wood, Allison Cobb wanders Brooklyn’s famous nineteenth century Green-Wood Cemetery and discovers that its 500 acres--hills and ponds, trees and graves--mirror the American landscape: a place marked by death but still pulsing with life. Through the lens of Green-Wood, the book explores the history of the American landscape, changing attitudes toward the land, and the impacts of private property, industrial poisons, and war. This is history and poetry, a testament to what survives and an elegy for what is lost--the long dead, the landscape itself, but especially those who died in the twin towers and in the United States’ ongoing wars. Cobb is a transplant like me, having moved out here from NYC before I did, now in Portland. Been great learning the land from her, figuring out what's where. Quickly she's become a central figure in organizing and curating out here. Congrats to both lovely human beings. Occultations, the full-length book of poems that I've been working on for the past 3 years, is entering the home stretch, now being edited and typeset. Here's a mock-up of the cover, courtesy of Black Radish Books, with obviously some things not yet finished--blurbs not done, etc. I'm not sure whether I'll be sticking with the cover, either. So, maybe the thing will be bright pink and yellow with lots of pictures of dancing farm animals? You never know. Meantime, many thanks to Rachel Levitsky (whose incredible book Neighbor I've been writing on in relation to a poetics of spatial practice) and all the folks at Belladonna Books, as well as Thom Donovan, who has been tremendously supportive of Occultations, and of me, for putting myself and Eleni Stecopolous on the docket for a Belladonna New Books/New Presses Series reading at Dixon in NYC on April 13. Eleni's new book is Armies of Compassion, out from Palm Press, and is--I can attest, as I've heard/read a good chunk of it--extraordinarily good. So the reading, even if you hate my poetry, will be good. Official announcement coming soon, both here, at Belladonna, and elsewhere, but for now, if you're in the NYC area April 13, please join us. I'll have not just my book, but another title from Black Radish Books, Marthe Reed's Gaze, with me. Gaze, as I posted before, is a beautiful book. It should be a fun evening. I'm happy to have learned that I'll be catching up with a lot of old friends, as well as new friends, various poets and editors out of Black Radish and other presses who have recently contacted. So, a huge thanks again to Belladonna, Thom, and everyone who works on this series. Just got the proof book of Prefab Eulogies from Geoffrey at BlazeVox. So, it should be out in the next couple weeks. He did a great job cleaning up my designs inside and outside the book, and leaving alone the images I wanted to look amateurish, as if goofed up by a corporation that sells poetry advice. It's nice to hold a book in your hands after reading it over and over in pdf form, INDD, etc. This is true for me regardless of whether it's by "me" or by the authors for whom I've done editorial work. Each time I hold the book-object I do re-assess my notion that the book can be dispensed with a great deal of the time, that I don't mind the physical book becoming less of a commercially viable commodity and more of a niche market art object. Yet I still dislike it when someone says: "there's just something about holding a book...." There is also nothing quite like the feel of making your own cheese. One can go on like this, make a nostalgia list, and it really means very little outside the given fetish. The difference is in who owns what: the book is part of a dying corporate empire, and so gaining control of its construction is a reclamation of one's work, hence one's work becomes one's passion, as in Geoffrey's case. Holding a book has nothing to do with regaining control of a dying corporate empire. Usually it's an act of complicity with keeping it on life support. Not so in poetry almost always, of course, and so as per my sacrificial trees post, I do not feel anything but pleasure holding the thing and staving off macular degeneration. Speaking of editing. I did some copy for an essay by Amy King awhile back, not knowing what King was going to do with this essay she read at the AMAZING Belladonna Conference on Feminism, Activism, & Poetry (thinking, that is, it was going to end up used for teaching purposes, etc, very mysterious to me at the time as I think I was very busy doing a lot of nothing). And then, er, bam: it's published in Free Verse and everyone can read it. Which I would suggest, as I think it's a clear, hopeful essay, or, perhaps more precisely, a poetics of King's What Else in a larger (more encompassing) Queer Poetics. The latter work by Nico (who came down with Robert to hear Chris Mann perform for our PRESS series) I'd wanted to pick up for awhile now, as there's been quite a lot of buzz about this big multi-genre book. This is for Stephen Cope, who, when I told him I was mapping out The Wittgenstein House using Barthes (as in the insipid Roland) cutups for this essay, said: "You mean that pleasure guy?" Loved it. Suicide as chess move (trebuchet). The trebuchet is a mutual zugzwang. Whichever player is on the move will lose. Philosophers Writers often behave like little children who scribble some marks on a piece of paper at random and then ask the grown-up "What's that?" He goes to bed thinking of houses. Every time a plane rumbles overhead he covers his face. A-e-r-o-p-l-a-n-e-s. If you spell it out, war is fun. Lecture: the lecture the outline of story, does not wound. Were it written a long time ago, it would not wound, though then it did have the capacity. But it was, and always will be, safe. Only now it’s meaninglessly safe. Which is to say unsafe but not wounding. Necrophilia: comes from Ranciere thru Lyotard-- "In trying to posses it, one kills off that which one loves. This is a form of necrophilia." You wish to unlearn in a place. Is it tonight subprime for us. Deduce me, I deduce you. Your name nor mine was there. The numbers are in, and this afternoon's rally for education and against budget cuts, layoffs, and tuition increases, turned out an estimated 150+ students, staff, and faculty. The rally was part of today's walkout, in which on Evergreen's campus, most classes were cancelled. For a Friday, 150 plus is a damn good number. That means people are pissed and worried. Given that this was the first action here at Evergreen, I'm hopeful that we, like other state workers, students, and community members in other states, can have an impact on legislative decisions. My thanks to the organizers of the rally/walkout. Last night Chris Mann performed a new piece working thru the signing tangles of "repetition," "knowledge," "madness," "teacher" as ill and student as "cure," and "the right to be misunderstood"--exciting for me, working on a couple essays, including one just published in Sibla, that deal with the aesthetics of repetition. I will stand firmly by this: I do not know why (or desire not to ruminate on) Chris gets so little attention in New York's "Art World," as he's doing work far more interesting than a lot of artists working right now. Chris performed what is now part of his ongoing polyvocal/interactive web project The Use, a then-new piece, in New York circa winter 2002. It was then that I first witnessed an indescribable, an "other" aesthetic discourse, Mann's auctioneer-speed gesticulating barrage of carefully choreographed (yet admitting for chance) work, For Head-Phones. A piece I worked with for a 4-channel performance (now part of Prefab Eulogies, soon to be downloadable at BlazeVox called "Eulogy for Headphones"), commissioned for The American Cybernetics Conference 2009, at which Chris also performed, which was my second time hearing/seeing him do what he does. Which, perhaps, is best described as an interrogation of speech that implores us to misunderstand, where discomfort is in some sense high stakes. If you do not feel discomfort during Mann's "performance," something has gone wrong. People at the well-attended event were into it, and indeed felt the discomfort, especially when realizing or refusing to realize, or deciding against being part of Mann's work insofar as the interactive part of it (overtly speaking), the discussion "afterwards," involves "the audience" interrogating itself as and against audience, in favor of...what? Where this question lingers until we all go home. I only regret feeling too ill to join up with Chris and Arun Chandra and Elizabeth Williamson, co-sponsors of the event, afterwards. Was nice to see him, tho, and I hope to set up something with Chris in New York next time I'm there for a sustained period. Still odd to me, very odd, that Mann's work is commissioned so often and so widely everywhere but, it seems, in the city where he lives. Just finalized the course description, which is now up on Evergreen's website, of my (our) spring 2010 Evergreen course. This should be fun. And I'm hoping to team up with visiting artist Jeff Glassman to co-teach this program, tho nothing finalized on that yet. Meantime, if interested, drop me a line or go online & register. Note: This 8-credit program will meet from 5:30 to 7:30 p.m. on Tuesdays and Thursdays and from 4 to 8 p.m. on Saturdays. During the quarter, our meetings will consist of weekly seminars, lectures, and “language labs”—times for brainstorming, rehearsing, and trying out language experiments. Guest artists will also come to campus to work with us. By the end of the quarter students will have a new portfolio of writings and, where appropriate, will have developed existing portfolios through collaborative refashioning and critique. Readings will include selections from The Kenning Anthology of Poets Theater, Adorno’s Aesthetic Theory, Ranciere’s The Politics of Aesthetics, and individual pieces by Bertoldt Brecht, Hannah Weiner, Tina Darragh, Chris Mann, Thalia Field, BARGE, Nonsense Company, Tonya Foster, Kaia Sand and Jules Boykoff, Laura Elrick, and Rodrigo Toscano. Though helpful, students are not expected to have a background in either creative writing or theater to do well in this program. As I get ready to meet up with Chris Mann, then hear him perform for our second PRESS event of the winter, I'm thinking about how amazing Kaia Sand and Jules Boykoff were last week, and how grateful I am that they're in the region and doing what they are doing: finding new, rather exhilarating ways to intersect and collide oft-thought-of "political" and "aesthetic" spheres. to a trans-national stag party"
and other gems, including one of my favorite poems in this hyper-sonic collection, this auctioneering of warped eternal present faux recollections born of the latest capitalism money can't buy, "Notes from the International Association for the Advancement of Creative Maladjustment." The poem begins: "I was all jacked up on freedom juice again." And moves on from there, multidirectionally, trying to capture but necessarily failing to capture, one's own--our own--market driven madness. In contrast to Jules' work, which--besides being often devastating in its critique of itself as necessarily a product of the culture industry (its critique of us)--often feels to me like being jabbed in the ribs by a friend acting out the persona of the joke-teller, Kaia's work is quieter, raging from the inside out, its lyricism being one central point on a literal map that is her new work, Remember to Wave, around which these life-structures in Portland turn. So many habitations are mapped out, their sociopolitical, their social grid lines mapped out not just by Kaia, but by what Kaia's research unearthed as document, as letter form, as well as her tour group's often startling observations. These habitations are often the most occulted in this one area's history, where, for example, Kaia concentrated her reading last week very much on the section of Remember to Wave that charts out the internment of Japanese people at the Portland convention center's storage lockers, the lockers turned into "living quarters," i.e., "prisons." One work from which Kaia read involved giving "voice" to silent archive home movie footage from (I think?) the 1960s, again charting this area of the Portland Convention Center in a different way, this long lyrical poem incredibly captivating, the large screen footage dividing our attention between the seen and the heard in ways not unlike Laura Elrick's work, on which Sand has written recently (see posts below on both Remember to Wave and Laura Elrick's Stalk, which has been fleshed out and lengthened as an essay forthcoming). The two combined for a deeply engaging contrast, and as the gracious, committed activists they are, offered several plugs for CA Conrad's arrival in March. As, for those of you familiar with Boykoff, Conrad, and Sand, the three are engaged in similar political enactments thru language, and are, as Boykoff spoke about during the discussion after the reading, part of a larger phenomenon of site-specific and sociopolitical spatial practices / concerns at work in contemporary poetry, "witness" post-Oppen, not dissimilar to the site-specific arguments and engagements in visual arts last decade, continuing to evolve currently (and inform poetry & poetics). I'll try to dig up photos of the event as well as quotes/images from Kaia's Remember to Wave (both, at the moment of this writing, are being circulated among Evergreen students who could not make the reading itself). In the meantime, take a look at some posts below, and go here for a snapshot of Kaia's map-making (from Wheelhouse PRESS Anthology 2009), and head over to Factory School and Tinfish Press website for further ordering information.